OBJECTIVE: Bauhinia purpurea (BP) Linn. (Caesalpiniaceae) is a plant of great medicinal importance and has been used since ancient times for treating many inflammatory conditions including arthritis. This study investigates the anti-arthritic potential of the hydroalcoholic extract from the stem bark of BP. MATERIALS AND METHODS: The anti-inflammatory and anti-arthritic activity of BP at various doses was used to evaluate its anti-inflammatory activity and anti-arthritic activity. Serum of arthritic rats was collected at day 21 for detecting serum cytokines level and to evaluate the effect of BP on its serum level. Furthermore, the safety of BP was evaluated in acute (5 days) and subacute (28 days) toxicity study in rats. RESULTS: There was a significant inhibition (P < 0.01) in paw edema at a different time scale with different doses of BP (50, 100, and 200 mg/kg). BP also demonstrated dose-dependent anti-arthritic activity on all observation days (3, 7, 14, and 21). In addition, there was also a significant decrease (P < 0.01) in oxidative stress markers, circulating pro-inflammatory cytokine (tumor necrosis factor alpha from 45.91 to 37.44, interleukin-1 (IL-1) β from 18.24 to 16.06, and IL-6 from 69.77 to 58.44) and an increase in anti-inflammatory cytokine (IL-10 from 8.07 to 12.07) levels. BP was found to be safe with an oral LD50 value of >2 g/kg in acute toxicity study and also no toxicological effect was observed in the oral subacute toxicity study. CONCLUSION: This study demonstrates that BP bark possesses anti-arthritic activity potential and confirm its folklore use in the treatment of inflammatory conditions. Bauhinia purpurea (BP) Linn. (Caesalpiniaceae) commonly known as butterfly tree is a medium-sized flowering plant found throughout in India and China. Conventionally, it has been used for many inflammatory and noninflammatory conditions such as pain, inflammation, epilepsy, and convulsion. Some studies have demonstrated its significant effect on pain and inflammation using an animal model. Despite these conventional uses, there is a dearth of an experimental study to validate these claims. 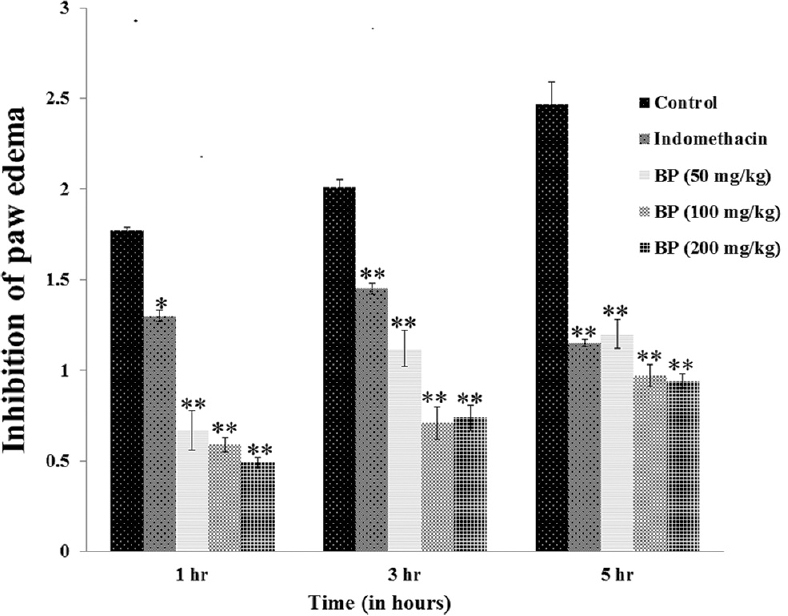 Therefore, to evaluate the anti-arthritic potential of stem bark extract (hydroalcoholic) of BP, the current study was designed using animal model. BP bark was procured in the March 2012 and authenticated by Prof. S. H. Ansari, Department of Pharmacognosy and Phytochemistry, Faculty of Pharmacy, Jamia Hamdard, New Delhi. A voucher specimen (Voucher no-SS/AIIMS/Pharma/007/12) of the plant has been retained in the Department of Pharmacology herbarium, AIIMS, New Delhi, for future reference. The procured bark was washed properly and then allowed to dry at room temperature. The dried bark was then powdered using a mechanical grinder. Hydroalcoholic extraction of powdered bark was then performed to obtain the crude extract. The extract was further concentrated using vacuum evaporator. The approximate percentage yield of the dried extract was found to be 4.32% w/w. with respect to the powdered bark. On carrying out pharmacognostical standardization, the dried extract of BP had shown to contain the polyphenolic compounds. The study was performed according to the criteria for the Care and Use of Animals in Scientific Research (INSA 2000). A due approval was obtained from the Institutional Animal Ethics Committee (714/IAEC/13) before starting the work. The experiment was performed on adult male rats. They were of Wistar albino variant weighing 150–180 g. They were left to acclimatize to animal house condition in a group of 3 for 1 week after bringing them from the institutional breeding stock. They were treated with standard pellet diet and water. The animal house temperature was maintained at 25°C ± 2°C with 12 h light and 12 h day cycle. Five groups of animals each containing six animals were used in this study. After overnight fast, first of all, baseline paw volume was measured on the day of the experiment. Digital plethysmometer was used to measure paw volume. Latterly by oral gavage feed, Group I was administered 2 ml/kg gum acacia suspension, Group II was administered 3 mg/kg indomethacin, and 50, 100, 200 mg/kg BP to Group III, IV, V, respectively., To produce inflammation, λ-carrageenan was injected into the left hind paw of the animals in the subplantar region. The process of paw inflammation was carried out 30 min after the administration vehicle and drug to the respective group of animals using 0.1 ml of 1% λ-carrageenan which was freshly prepared in normal saline. Post carrageenan measurement of paw volume was again performed at three different time scale, i.e., at the end of 1st, 3rd, and 5th h after carrageenan injection. In this study, again five groups of animals were used such as “carrageenan-induced paw edema” model. Like the previous study, Group I was given vehicle, Group II was given indomethacin, and Group III, IV, V were given BP at the same dose. On day 0, baseline measurement of the paw diameter was carried out. Micrometer screw gauge was used for the measurement of the joint size. Thereafter, vehicle/drug was administered to the respective groups by oral gavage feed. The process of arthritis induction was carried out in the left hind paw by subplantar injection of 0.1 ml complete Freund's adjuvant (CFA). It was done 30 min after the administration of vehicle/drugs to the respective groups of animals., This was followed by daily administration of vehicle/drugs to the respective groups for 20 days. Measurement of joint diameter was again carried out on 3rd, 7th, 14th, and 21st days. On the 21st day of the study, blood sample was collected for estimation of cytokines level present in the serum. The serum level of different cytokines (tumor necrosis factor alpha [TNF-α], interleukin-6 [IL-6], IL-10, and IL-1 β) was estimated by dot-blot technique. To estimate the level of prooxidant malondialdehyde (MDA) and antioxidants such as superoxide dismutase (SOD), catalase (CAT), and endogenous glutathione (GSH), a 10% tissue (liver) homogenate were prepared with the help of a homogenizer. Estimation of MDA and endogenous GSH was then performed using the cellular homogenate of the liver. A small part of the cellular homogenate of the liver was then centrifuged at 500 rpm to get the supernatant. This was followed by estimation of total protein, SOD, CAT, and enzyme activities using the supernatant. To detect serum cytokines level, first of all, 3 μl of serum was mixed with 7 μl of phosphate buffer saline and then blotted on a membrane made up of nitrocellulose. The blotting process was done with the help of a micropipette. It was then treated with 5% nonfat milk to block the nonspecific sites. It was further treated with cytokine-specific primary antibodies (Santa Cruz Biotech Inc.) followed by treatment with secondary antibodies. Finally, it was stained using diaminobenzidine containing enhancer in the form of heavy metal nickel. An advanced version of the gel documentation system, i.e., Alpha Imager EC Gel Doc System was then used to document the protein present on the nitrocellulose membrane, and using AlphaView Imaging software, protein densitometry was done and expressed as percentage-integrated density value. The harmful aspect of BP if any was tested by performing acute and subacute oral toxicity study. For testing the acute toxicity of BP, we followed the latest OECD guideline 425 (OECD, 2001). An acute toxicity study was performed on five rats by orally administering a single dose of BP (2 g/kg). The rats were then observed for 14 days for mortality if any. Subacute oral toxicity study of BP as performed according to the OECD guideline-407 (OECD, 2008). Two groups of animals each containing eight animals were used in this study. Group I served as normal control and was given 1 ml/kg normal saline. Group II was treated with 400 mg/kg BP (two times the maximum dose tested in the ant arthritic model). The oral administration of saline and BP to the respective groups of animals were continued for 4 weeks. The data obtained after studying the various effect of BP using the appropriate rat model were revealed in the form of mean ± standard error of the mean. The method that was adopted to find the difference in significance from the statistical point of view was one-way ANOVA followed by Dunnett's multiple comparison (GraphPad InStat; Version 3.05, GraphPad Software Inc, California, USA). The value that was considered significant from the statistical point of view was <0.05. 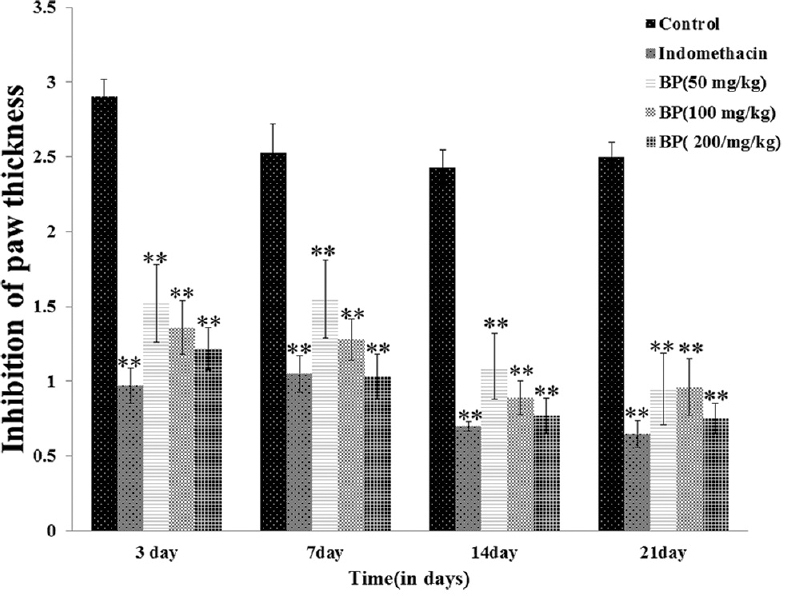 The modulatory effect of BP following subplantar carrageenan administration has been shown in [Figure 1]. Following the carrageenan injection, there was an intense inflammatory response causing an increase in paw volume and the maximum increase in the paw volume was observed at 5 h in all the groups. However, BP (100 and 200 mg/kg) treated animals showed a marked reduction in paw edema at all-time points in comparison to the control animals. The dose of BP that produced a maximum reduction in paw volume was 200 mg/kg. The anti-arthritic action of BP following the subplantar injection of CFA has been depicted in [Figure 2]. Following CFA administration there was an increase in joint diameter which was maximum on day 3. After that, there was a progressive decrease in joint diameter in all the groups except the vehicle-treated where it was increased up to some extent after the 14th day. Treatment with indomethacin and BP resulted in a remarkable decline in joint diameter and the decline was statistically significant in comparison to vehicle-treated group. There was a remarkable change in the serum level of oxidants and antioxidants following CFA immunization [Figure 3]. The level of antioxidants decreased in all the experimental groups of animals, whereas an increased level of Thiobarbituric acid reactive substances (TBARS) was noticed in all the groups. Following BP treatment there was a decrease in the level of oxidants, and at the same time, there was an increase in the level of antioxidants. Out of three different doses of BP, the dose that was found to be most effective in increasing the level of antioxidants and decreasing the level of oxidants was BP (200 mg/kg). A qualitative comparison of serum cytokine levels is represented in [Figure 4]. It is quite obvious from the figure that BP treatment had a favorable effect on the serum cytokines of arthritic rats. BP treatment produced a fall in the level of pro-inflammatory cytokines responsible for inflammation. On the other hand, it produced an increase in the serum level of IL-10. The changes in the level of cytokines were found to be statistically significant. BP was found to be safe on toxicological evaluation. It did not produce any behavioral change or mortality in the tested animal during the observation period of 14 days following the limit test. The oral LD50 of BP was therefore established at >2 g/kg body weight in rats. In addition, following subacute toxicity study, BP-treated group showed no change in physiological and biochemical parameters in comparison with control. This study investigates the anti-arthritic and anti-inflammatory potential of the hydroalcoholic extract of the stem bark of BP using well-established experimental rat models. We evaluated the anti-arthritic potential of BP using various arthritic and the anti-inflammatory model. 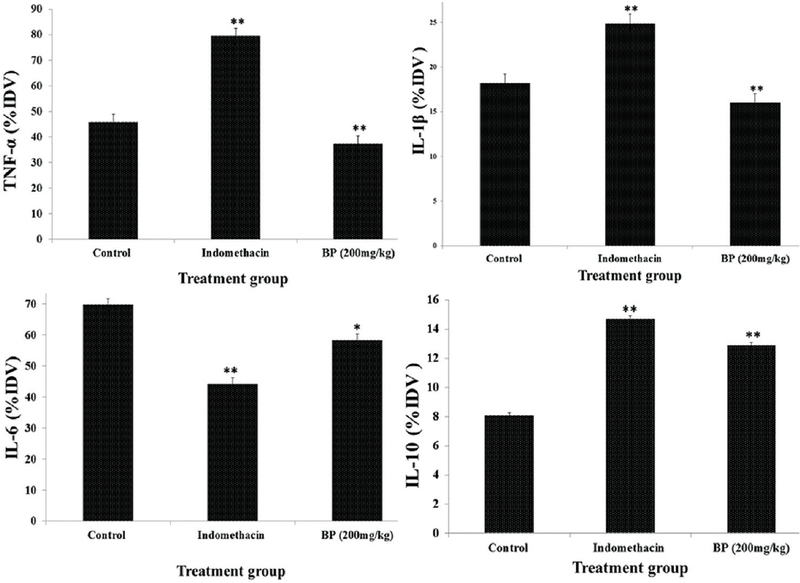 Carrageenan-induced paw edema model is not only a well-established model but also a very commonly used model for screening anti-inflammatory potential of a drug. The triphasic inflammatory changes produced by injecting carrageenan are quite similar to the early exudative stage of inflammation in human. This triphasic inflammatory change is because of the involvement of multiple autacoids. The first phase which lasts for ~1 h following carrageenan administration is characterized by a sudden increase in paw volume induced by the action of histamine, the second phase which lasts for ~2–3 h postcarrageenan administration is because of generation of serotonin and kinins, and the third phase which is attributed to the generation of prostaglandins and leukotrienes which lasts from ~4–6 h after postcarrageenan administration., This study shows that BP treatment produces significant inhibition of inflammation at all observation period suggesting its modulatory activity against several autacoids. CFA-induced arthritis is a very suitable model for testing anti-arthritic activity as it has a very high degree of validity and has many similarities with human arthritis., In this study, we found that the animals treated with BP had a decrease in joint size in comparison to the control rats which was dose dependent. Further, administration of BP restored the imbalance resulted from oxidative stress by decreasing pro-oxidant (MDA) and increasing antioxidant (SOD, CAT, and GSH) parameters as compared to control. In addition, we also estimated and performed the qualitative comparison in the serum level of pro-inflammatory and anti-inflammatory cytokines. We found that the levels were upregulated in the serum of vehicle-treated arthritic rats., On the other hand, there was a significant reduction in the level of pro-inflammatory cytokines and an increase in anti-inflammatory cytokines in BP-treated arthritic rats. The levels of TNF-α and IL-1 β were found to be upregulated in indomethacin-treated arthritic rats, and the finding was quite similar to the findings reported earlier. Based on circulating cytokine profile, BP may be having different or additional mechanisms (in comparison to indomethacin) which are responsible for its anti-arthritic effect. The important phytochemical principles present in BP are flavonoids, steroids, and tannins.,, The anti-arthritic activity may be because of these phytoconstituents present in the bark extract of BP, especially flavonoids which are shown to have anti-inflammatory and antioxidant activity. The role of flavonoids in inhibiting phospholipase A2, phospholipase C, and nuclear factor-Kappa B that mediates inflammation is well proven. However, due to the presence of the multiple phytochemical presents in BP, it can be said with certainty that the observed anti-arthritic of BP was not only because of flavonoids. Based on an LD50 value of >2000 mg/kg body weight, BP can be considered to be safe in acute intake of high dose. Furthermore, the absence of any noticeable physiological, biochemical, or histopathological changes following high-dose BP (400 mg/kg) demonstrates a safer toxicity profile. The positive result obtained in our study suggests that there is a need for further study to explore BP as a safer therapeutic alternative for arthritic patients. McInnes IB, Schett G. The pathogenesis of rheumatoid arthritis. N Engl J Med 2011;365:2205-19. Cronan TA, Kaplan RM, Posner L, Blumberg E, Kozin F. Prevalence of the use of unconventional remedies for arthritis in a metropolitan community. Arthritis Rheum 1989;32:1604-7. Jain SK, Tarafder CR. Medicinal plant-lore of the santals: A review of PO. Bodding's work. Econ Bot 1970;24:241-78. Shreedhara CS, Vaidya VP, Vagdevi HM, Latha KP, Muralikrishna KS, Krupanidhi AM, et al. Screening of Bauhinia purpurea Linn. For analgesic and anti-inflammatory activities. Indian J Pharmacol 2009;41:75-9. Dey PM, Harborne JB. Methods in Plant Biochemistry. London: Academic Press; 1987. Kumar R, Gupta YK, Singh S, Raj A. Anti-inflammatory effect of Picrorhiza kurroa in experimental models of inflammation. Planta Med 2016;82:1403-9. Winter CA, Risley EA, Nuss GW. Carrageenan-induced inflammation in hind paw of the rat as an assay for anti-inflammatory drugs. Proc Soc Exp Biol Med 1962;111:544-7. Kumar R, Gupta YK, Singh S, Arunraja S. Cissus quadrangularis attenuates the adjuvant induced arthritis by down regulating pro-inflammatory cytokine and inhibiting angiogenesis. J Ethnopharmacol 2015;175:346-55. Newbould BB. Chemotherapy of arthritis induced in rats by mycobacterial adjuvant. Br J Pharmacol Chemother 1963;21:127-36. Moron MS, Depierre JW, Mannervik B. Levels of glutathione, glutathione reductase and glutathione S-transferase activities in rat lung and liver. Biochim Biophys Acta 1979;582:67-78. Kumar R, Nair V, Gupta YK, Singh S. Anti-inflammatory and anti-arthritic activity of aqueous extract of Rosa centifolia in experimental rat models. Int J Rheum Dis 2017;20:1072-8. Organization for Economic Cooperation and Development. Guidelines for the Testing of Chemicals. Paris, France: Organization for Economic Cooperation and Development; 2001. p. 425. Organization for Economic Cooperation and Development. Guidelines for the Testing of Chemicals. Paris, France: Organization for Economic Cooperation and Development; 2008. p. 407. Vinegar R, Truax JF, Selph JL, Johnston PR, Venable AL, McKenzie KK, et al. Pathway to carrageenan-induced inflammation in the hind limb of the rat. Fed Proc 1987;46:118-26. 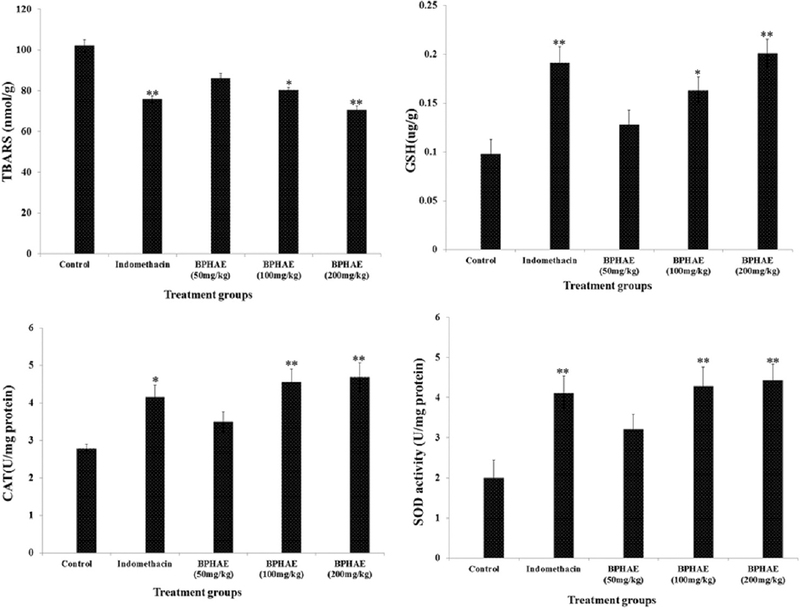 Kumar R, Gupta YK, Singh S, Arunraja S. Picrorhiza kurroa inhibits experimental arthritis through inhibition of pro-inflammatory cytokines, angiogenesis and MMPs. Phytother Res 2016;30:112-9. Ulfgren AK, Lindblad S, Klareskog L, Andersson J, Andersson U. Detection of cytokine producing cells in the synovial membrane from patients with rheumatoid arthritis. Ann Rheum Dis 1995;54:654-61. Feldmann M, Maini RN. Anti-TNF alpha therapy of rheumatoid arthritis: What have we learned? Annu Rev Immunol 2001;19:163-96. Sacerdote P, Carrabba M, Galante A, Pisati R, Manfredi B, Panerai AE, et al. Plasma and synovial fluid interleukin-1, interleukin-6 and substance P concentrations in rheumatoid arthritis patients: Effect of the nonsteroidal anti inflammatory drugs indomethacin, diclofenac and naproxen. Inflamm Res 1995;44:486-90. Yahya F, Mamat SS, Kamarolzaman MF, Seyedan AA, Jakius KF, Mahmood ND, et al. Hepatoprotective activity of methanolic extract of Bauhinia purpurea leaves against paracetamol-induced hepatic damage in rats. Evid Based Complement Alternat Med 2013;2013:636580. Kumar T, Chandrashekar KS. Bauhinia purpurea Linn: A review of its ethnobotany, phytochemical and pharmacological profile. Res J Med Plant 2011;5:420-31. Nam NH. Naturally occurring NF-kappaB inhibitors. Mini Rev Med Chem 2006;6:945-51.